The Alabama deal is from 4/13/11 - 4/23/11, so you should still be able to pick up a cheap Aldi ham in Alabama and Tennessee. While it is only a few areas that are participating in the $5 off Ham deal, I suggest you check out the ham freezer at your local Aldi store, as you might just get lucky and find an unadvertised in-store discount. 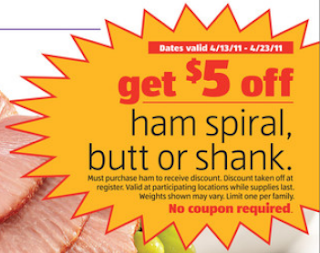 Did you have this $5 off Ham at Aldi offer in your local ad?